Giving it up all for Love.. I am honored to be on board as marketing chair for his heart warming charity- Wish Upon a Wedding, The world's first non-profit organization granting wedding wishes to couples faced with terminal illness regardless of sexual orientation. Upon delivery of a terminal diagnosis, relationships are always put to the test, but true love conquers all, and backing this charity is near and dear to me, as providing these sacred memories through a beautiful wedding seals a vow to love and take care of one another for all the days of their lives that remain or hope to come. I am a bit sentimental, with our launch event arriving, we welcome our local community to come out support, celebrate, mingle, enjoy and give back to the charity. Sponsorship opportunities available contact me at beatcreative@gmail.com for more info. You are cordially invited to attend the Wish Upon A Wedding Launch Event which is aptly titled as "Give It Up For Love!" This premier event is being held on Thursday, May 27th, 2010 at 6pm. 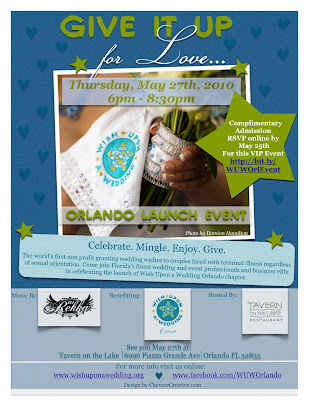 Florida's finest wedding and event professionals will be in attendance as well Orlando's business elite! You're welcome to join us too - the more the merrier! We want to get the word out about this fabulous organization and share information about how everyone can get involved to locally! Wish Upon a Wedding anticipates granting dozens of wishes per year with the possibility of that number reaching into the hundreds. Currently there are 18 Chapters across the US and the organization's goal is to offer Wedding Wishes in every major city across the country. For all the latest information, visit the Wish wish=""> Upon A Wedding - Orlando Facebook page! As of Friday, April 30, 2010, ABC is pleased to announce a partnership with the world's first "wedding wish granting organization", California based Wish Upon a Wedding. Founded by ABC member Ms. Liz Guthrie and ABC celebrity wedding designer and WUW President Ms. Sasha Souza, WUW's goal is to design and donate special weddings to couples where one has a terminal diagnosis of less than 36 months. By relying on the generosity of wedding and hospitality vendors, known as Wish Granters, Wish Upon a Wedding is able to provide all the goods and services needed to produce these memorable occasions.